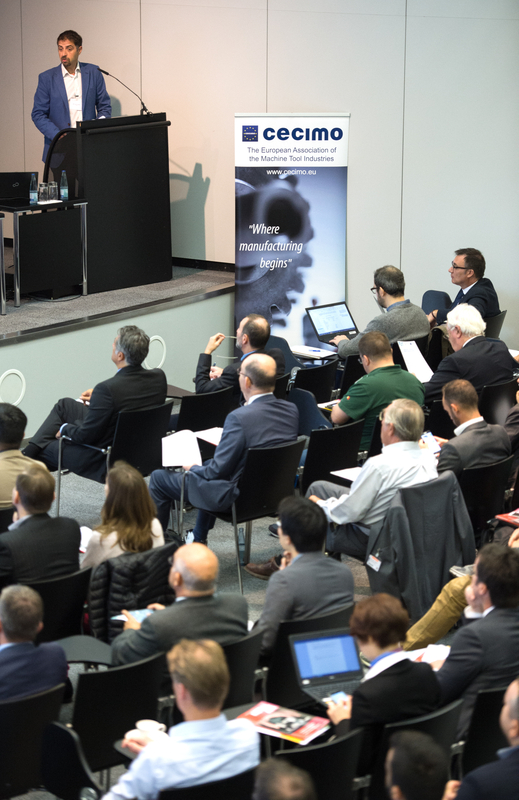 Hannover, 21 September 2017 – During EMO Hannover 2017, KRAKEN supported the “International Conference on Additive Manufacturing” and presented the latest developments within the project on hybrid material additive manufacturing and the CAM system. EMO is the world’s premier trade fair exhibiting the entire bandwidth of modern-day metalworking technology. This year, EMO took place in Hannover between 18 and 23 September and counted around 2200 exhibitors from all major industrial sectors, such as machinery and plant construction, the automotive industry and its component suppliers, aerospace technologies, precision mechanics and optics, shipbuilding or medical technology. With the support of KRAKEN project, CECIMO organized the “International Conference on Additive Manufacturing”, which took place on 21 September and gathered around 130 participants. At the event, José Antonio Dieste, Head of the Mechatronic Department at AITIIP and KRAKEN coordinator, presented the project and progress so far. He explained how the KRAKEN Project consortium has developed new thermoset resin materials, and a novel technology, that permits to print parts with deposition rates around 1kg per minute. The project creates also new metal interface layers that will enable the development of hybrid material (polymer-metal) printing in the coming future. This new development will be the first step for metal additive manufacturing on free form base supports and, at the end, “Kraken will enable the future of Additive Manufacturing to large dimension components”. Steve Youngs, Development Director at Vero Software another of the partners in KRAKEN, focused on the challenges for CAM software in hybrid manufacturing, where additive and subtractive operations are integrated in a single machine. As the process’ complexity increases, innovative CAM solutions should be able to guarantee ease of use and correctness by ensuring a common workflow and solid computer-based simulation. The conference featured other speakers: Güngör Kara, Director of Global Application and Consulting at EOS, and Coen De Graaf, Project Leader of Vanguard Project for South Netherlands. José Antonio Dieste, Güngör Kara, Marc Saunders (Director of Global Solutions Centres at Renishaw) and Daniel Lichtenstein (Head of Market Development Additive Manufacturing at TRUMPF) ended the event discussing about the challenges and solutions to speed up the industrialization of additive manufacturing and the most promising markets in the near future. The KRAKEN Project aims at developing a hybrid and automated multi-material machine, combining both subtractive and novel additive manufacturing technologies, for the production of functional parts up to 20m long with high accuracy and quality. The parts will be made in aluminium, thermoset or a combination of both materials. The KRAKEN concept (ceiling machine) will also decrease the floor space needed for the same number of products. Kraken newsletter issue 2 is now out!